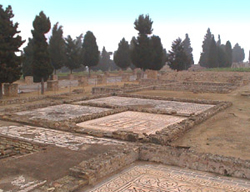 City of Italica, at Santiponce, Seville. 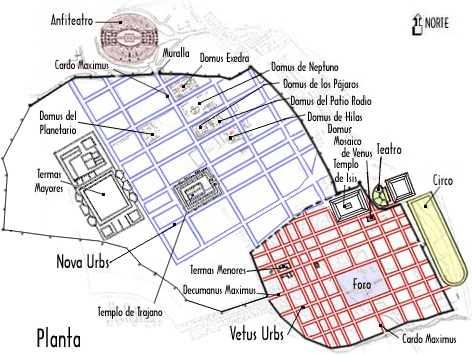 Plan of both Roman cities at Italica, on the actual plan. Probably, the first city founded by Romans out of Italica Peninsula was devoted to it and bore its name. After beating Carthaginians at battle of Ilipa Magna - Alcala del Río- imperator Publius Cornelius Scipio "the African" founded city of Italica on 206 b.C. It was conceived as a rest home for wounded soldiers and veterans home -vicus civium romanorum-. So, old city -vetus urbs- was created: a place where village of Santiponce would be elevated at 16th century. Therefore, the almost whole of buildings is now lost. Fame that Baetic area would get for Roman world -from 1st and specially at 2nd century- was the result of improving of this region cities. It brought military and commercial security and introduced outstanding characters for Roman Empire. Emperors Trajanus (97-117) and Adrianus (117-137) came from two families from Italica. Their direct influence made that city improved in every field: many buildings for public, social and cultural services were built. Emperor Adrianus designed a new city -nova urbs-. It was called Colonia Aelia Augusta Italica. This new city was endowed with wider streets and many porticated pavements. It was the result of being a honoured urbs, specially loved by Adrianus. Its rectangular areas, a consequence of perpendicular houses' intersections, made new rooms for houses and great buildings. Public services for water drainings and gutters were also created. 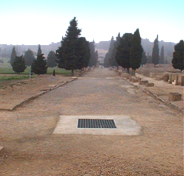 Remainings of water tanks -castellum aquae- and gutters have been preserved. 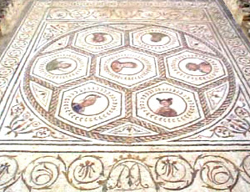 House of Neptune. Another high-class house. It is big, with its own terame and good mosaicss. House of the Rhodian Patio. As its name shows, it had a "peristylium" looking like a Rhodian patio -with different levels communicated by stairs-, because of being placed on a slope, as house of Hylas. House of the Planetarium. So called because of the mosaic that pavimented one of its rooms. It represents a central hexagon with six perimetral: one at each side. Everyone shows its divinity according to each week's day. The Termae. There are remainings of two termal wholes: major and minor termae, placed at the nova urbs and the vetus urbs. Majors occupied a big room inside the new city. 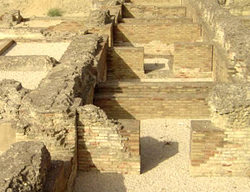 Structure of distribution of pools and furnaces is preserved. The Walls. There are few remainings. Most outstanding is the door with two rectangular plan towers. Temple of Trajanus -Traianeum-. See planIt was devoted to the most illustrious son of the city: the divine Trajanus. The temple was placed at a place on the upper city area. It was surrounded by an exedrae porticus. It had a rectangular plan with an octastyllum peripteral portico -with eight columns-. It was placed on a basis podium. Access was made through stairs. A great part of Roman remainings was lost when they were used as constructive elements for changing Guadalquivir river current at the time of wars between Visigothic kings Leovigildus and Hermenegildus.